The new game that WinADay Casino promised us during its 9th birthday celebrations this month has just arrived! With geisha girls, lanterns and origami spinning on reels set in a garden of cherry blossoms,the new Trip to Japan slot game celebrates the unique culture of Japan and the mystery of the beautiful Land of the Rising Sun. Trip to Japan is a 5x4 slot with 20 fixed paylines. We can choose to bet 20, 100, 200, 400 or 800 coins, each worth $.01. The minimum bet is $0.20 per spin and the maximum bet is $8.00. There’s a Wild as well as a Double Wild which doubles any win it’s in. Hit three Bonus symbols to trigger a two-phase bonus feature. First, the symbols on the reels are replaced with 20 coins. You click on coins to reveal the number of free spins you get. Then your free spins start. With every win the multiplier increases by 1X, up to 5X. This is WinADay's first new game to feature the new user interface they've come up with. The main menu is a pop up so the game screen isn't crowded with controls. We now have one click access to the cashier, promotions, game settings, game help and the casino lobby. Until June 28th, if you've made at least one deposit you'll receive a $20 freebie to try the new Trip to Japan. If you're a VIP player you'll get an up to $150 freebie. There's also a selection of deposit bonuses with various wagering requirements available until next Wednesday. 25X wagering requirement, 5X max. cash-out. 27X wagering requirement; valid for Trip to Japan only. 16X wagering requirement. May be claimed twice a day and may also be used for video poker. 16X wagering requirement; may be claimed twice a day. 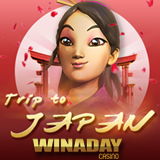 WinADay Casino now offers 34 unique premium slots to players all over the world as well as roulette, Keno, 20 penny slots and 10 video poker games. Most slots are tied to a site-wide progressive jackpot which is currently approaching $200,000. WinADay is an instant-play online casino with no software to download and install, compatible with Apple and Android smartphones and tablets.